With our wide variety of home theater and media room packages, you can choose a solution that perfectly fits with your home, your family, and your budget so that everyone from the novice to the enthusiast can enjoy a system that puts them on the cutting edge of entertainment. We take care to work with our clients when designing home theater or media rooms for them so that they end up with a system that works seamlessly with their home and perfectly suits their needs. 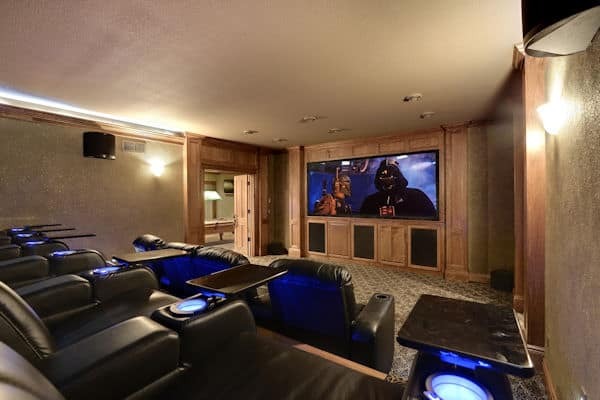 We consider television and projection screen size, speaker setup, component capabilities, remote programming and many other factors when creating your ideal media room or home theater. We are the ones to call no matter what size the project is, from installing a large TV or 120-inch projection screen to setting up a surround sound system that will make you feel like you’re in the action. We will work with you to deliver a media room that will blow you away. Our highly trained team of technicians are ‘plugged in’ on the very latest in audio and video technology so that we are always capable of delivering you the best system for your needs. They will seamlessly install all of your equipment so that it is out of the way and hassle-free. We have been in the business of fitting families with the media rooms of their dreams for many years, so we really understand the need for having a highly functional, beautifully designed family room.